With the 19 Degree Ellipsoidal Spotlight LEO, the future of lighting is here! 19 Degree Ellipsoidal Spotlight LEO is a "Next Generation" Light Fixture that outshines the competition! 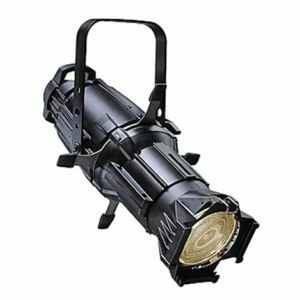 With a rugged, intelligent design and superior optical features, this ellipsoidal offers exceptional functionality and versatility. It is right at home in the sanctuary and has extraordinary brightness and high efficiency levels. Cool grip handles allow bulb replacement in under 30 seconds; even when the fixture is hot! A cast aluminum housing means it is extremely durable. With the 19 Degree Ellipsoidal Spotlight LEO the future of lighting is here! Includes: C-clamp, color frame, cord and 5-15p plug.